High build acrylic membrane. 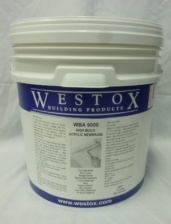 Used on concrete, brick, parapet walls, flat and pitched roofs, liquid flashings, FC and AC sheeting, following spalling concrete repairs, silos, cement render, plant rooms and low traffic walkways. Vertical 4m2 per Litre per coat. Horizontal 1.5m2 per Litre per coat.